On Tuesday, the Montgomery County Council unanimously turned down a plan by County Executive Ike Leggett to rebuild a portion of downtown Wheaton, favoring an alternate plan instead. Residents who supported Leggett's plan are frustrated at the defeat, but this wasn't the best path for redevelopment in Wheaton. The County Council voted to turn Lot 13 into a new town square and county offices. In recent months, Leggett and the council have disagreed on how to begin the redevelopment. Leggett proposed spending $42 million to build a new town square and a platform over the Wheaton Metro station for future development, while the County Council proposed spending $55 million to build the town square and offices for county agencies. The council ended up voting for a a combination of both proposals, providing funds for a county office building and town square now and to study building the platform later. The decision ends a long and often acrimonious debate over how to spark the redevelopment of downtown Wheaton. In February, Leggett's administration claimed that there wasn't enough money to pay for a revitalization scheme in Wheaton and a new Metro station entrance in Bethesda, pitting supporters of both projects against each other. When the council found funding for both projects, the conversation turned to the merits of Leggett's proposal. While County Council analyst Jacob Sesker wasn't opposed to building atop the Metro, he created the alternative proposals because he felt it wasn't feasible in the immediate future. 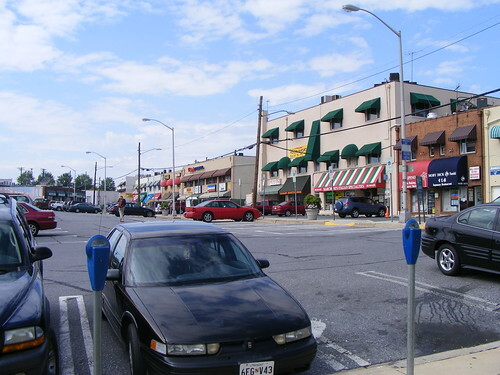 Meanwhile, the Coalition for a Fair Redevelopment of Wheaton has expressed concerns about local businesses, calling for a more substantial town square or a community benefits agreement. A platform may be built atop the Wheaton Metro station, but not for a while. These questions led to accusations that the council was being meddlesome and was opposed to making Wheaton better. After the vote on Tuesday, resident Henriot St. Gerard wrote a scathing blog post on Wheaton Patch calling it a "show of disrespect" to the community. Jobs are concentrated on the west side of the county and will remain there for a long time. In 2010, there were 506,000 jobs in Montgomery County, 70% of which are located along the I-270 corridor. Bethesda alone has 87,000 jobs, more than Silver Spring, White Oak and Wheaton combined. Plans for additional employment growth in White Flint, the Great Seneca Science Corridor, and Germantown ensures that the west side will continue to remain the county's job center. Companies located in East County aren't sticking around. Last year, defense contractor BAE Systems moved a branch office from Aspen Hill to Rockville. The empty building added to an already high vacancy rate in the Kensington-Wheaton area, where nearly a quarter of all office space is empty, compared to just 11 percent countywide. Lee Development Group, which owns the building, will replace it with a Walmart because they concluded that the area was "a retail destination, not an office center." Companies already located on the west side aren't interested in going east. The county is planning to create a research and development center in East County called the White Oak Science Gateway around the Food and Drug Administration's new campus. Though the area enjoys the lowest office vacancy rate in the county, with just 6 percent of offices sitting empty, it's unclear who will fill them. A recent report from planning consultants surveyed research and development firms located at the county's existing Life Sciences Center in Gaithersburg and found that wouldn't move to White Oak because they appreciate the proximity to other R&D firms along the I-270 corridor. Officials are more concerned about keeping jobs in the county than where they specifically end up. In addition to planning for future job growth on the west side, the county also gave subsidies to one company in exchange for moving there. Next year, Choice Hotels will move their headquarters from Silver Spring to Rockville with $4.3 million in loans and grants from the county, state and City of Rockville and additional tax credits. 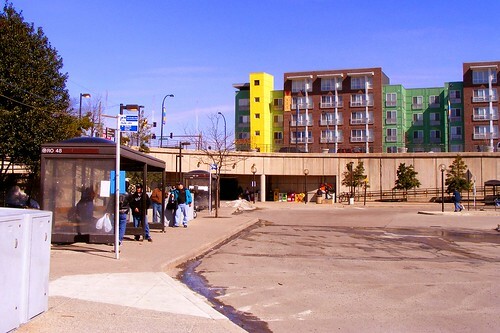 Choice Hotels wanted to be closer to a Metro station, so having them move to Wheaton would've met both their needs and Leggett's goals. But after seeing firms like Hilton Hotels and Northrup Grumman pass up Montgomery County for Northern Virginia, county leaders were surely relieved that they decided to stay here at all. 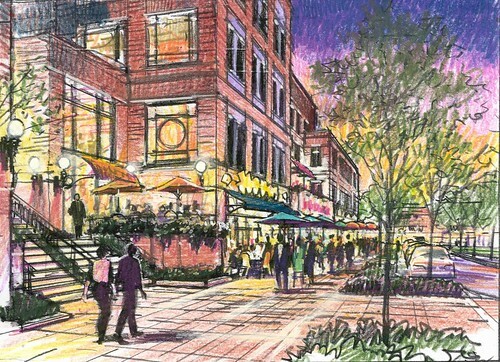 Concept rendering of downtown Wheaton from a 2004 charrette. Wheaton has many strengths: stable neighborhoods, diverse population, and a compact downtown well-served by both transit and major roads. But as a potential job center, it competes with larger and more established places like downtown Bethesda, the I-270 corridor, and others throughout Greater Washington. And that's why earlier recommendations for redeveloping Wheaton, both from the public and planning experts focused on housing, retail and entertainment in the short term, with offices coming later if demand warrants it. Residents are both eager and worried that redevelopment will turn Wheaton into a place like Silver Spring or Bethesda, but we shouldn't be limited to those examples. Skeptics of Leggett's proposal don't lack faith in Wheaton's potential. They recognize that Wheaton's constraints and strengths, if properly harnessed, will let it grow into something else entirely. ducci verishI would rather see Wheaton remain a place of small shops and restaurants and very little office space. If the County builds office spaces in Wheaton it will e inviting more morning traffic than we need. Georia Ave. and University Blvd. are already too crowded. The expectation that the office workers will take the Metro is overblown- . I would not want to see Wheaton become an overcrowded area like Bethesda or downtown Silver Spring. A lot of people -- including everyone from elected officials to bloggers -- need to stop giving any kind of acceptance to the notion of "East County is ours" because that sort of racialist exclusionary attitude is not rewarded by investors. Well, it might be rewarded by racialist investors but the Mainstream really despises that sort of attitude. And failure to invest is what causes ghetto, ya know? But that's over simplified. It's attitude that causes disdain to invest that causes ghetto.